Bob Barthman, More Space Place, Sarasota, Florida, was the Overall Winner of the 2017 Top Shelf Closet Design Awards. 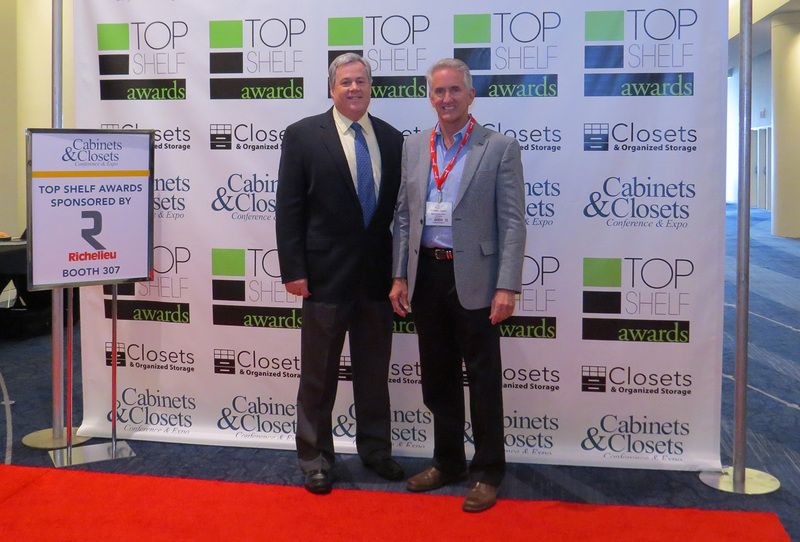 SCHAUMBURG, Illinois - Winners of the 2017 Top Shelf Closet Design Awards were celebrated at a red-carpet reception during the 2017 Cabinets & Closets Conference & Expo, which closes Thursday, April 13 at the Renaissance Convention Center in northwest Chicago. The Overall Winner of this year’s contest was Bob Barthman, More Space Place, Sarasota, Florida, who will receive a $500 prize as well as a Top Shelf Design Awards plaque awarded during the ceremony. Barthman also took home the top prize in the Home Office: Over 150 sq. ft. category for: Condo On the Bay - Nautical Home Office. The project features white laminate casework and a custom color match paint on traditional MDF door and drawer panels. Painted traditional crown moulding was installed all around the top of the bed and upper cabinets. While the judges have made their choice, Closets & Organized Storage magazine will open up the process to let the public have their say with a People’s Choice Award contest set to launch next Monday. Stay tuned to WoodworkingNetwork.com/closets more details. Bob Barthman, More Space Place, Sarasota, FLHome Office: Over 150 sq ft. This Condo sits on the third floor overlooking Sarasota Bay in Sarasota Florida. The room requirements were to be open with lots of storage. Antique White laminate caseworks and a custom color match paint on Traditional MDF door and drawer panels met the Customer’s approval. Painted traditional crown molding is installed all around the top of the bed and upper cabinets. His and Hers Master Closet; painted and infused with reclaimed wood materials. LED lighting, specialized drawers, mirror and rolling ladder. An existing closet with 10’ high ceilings grew larger by taking out a wall from an adjacent “piano” room. The extended closet now opened up into a 12’ high ceiling room where custom cabinetry would be built throughout both spaces. This solid maple wood cabinetry with custom white painted finish did not lack home owner specific storage. Impressed by a magnificent display of LED lighted clothes rods seen in a hotel, my clients wanted to discuss the possibility of having this striking closet lighting feature incorporated into their own home. Converted a 25-foot by 16-foot sitting room into a ladies dressing room. The goal was to create a dressing room that can accommodate all seasons. It consists of five wardrobes for hanging items and one cabinet for shoes with custom pull-out shelves for front to back shoe storage. Units are 24’d and 90’h with crown molding and decorative base molding. The panels are all angled cut to work around the sloped ceilings. The sitting room is over the garage. We maximized the existing closet with ample shelving for seasonal storage. The clients wanted to know to create hanging capacity for their child’s clothing and a set of drawers to replace the need for a dresser within the bedroom. They agreed on a solution that created sufficient depth for hanging items and a bank of five drawers. In this chocolate pear pantry you will find two roll-outs with fronts to hold extra toiletries that don’t stand up well, a hamper roll-out lined bin for soiled delicates. There are small shelves to either side of the center drawers to utilize the space. We used 16-inch deep roll-outs so there was adequate access into those smaller shelves. The key to developing a spa style master bath was to re-purpose the clothing storage area. 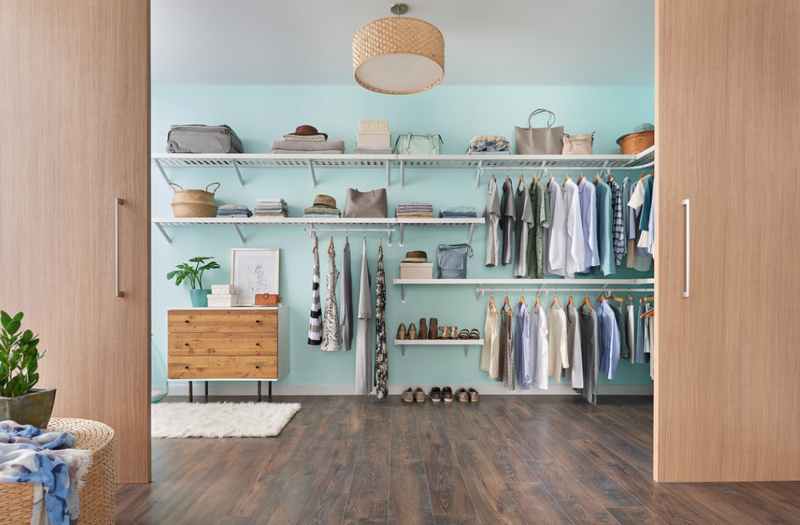 By eliminating the two walk-in closets and the dividing hall, and replacing it with a highly organized reach-in closet, enough floor space was gained to create the desired master bath spa, and still provide for the required clothing storage. The customer has a guest room that she also wanted to use for a home office. She is “paperless” so she just needed a simple desk for her computer and some nice storage, lighting, and display space around the bed. The expansive view of the harbor available from every room in this two bedroom condo is the focal point of this home. The unit is loaded with amenities, but one thing that cannot be added or increased is the overall size and number of rooms. Being able to use the spare room for multiple purposes was very important in planning the space. The second bedroom in this home is used as a home office most of day. However, in the evening and over the weekend, it becomes a fun movie room with reclining seating and a large screen TV. Four car garage organized for 5-member family. Features include: white material with generous seating with shoe storage and jacket and backpack hooks. Cabinet storage for sports gear, car care, art projects and paper goods. Overhead storage for outdoor furniture cushions and slat wall for yard tools. The client definitely wanted the garage to be an extension of the interior living space and wanted to maximize the cabinet storage space. Cabinets were designed to run from floor to ceiling and a matching crown molding was integrated to give the cabinets a very custom built in look. “How is your garage this clean?” is a question this client has been asked several times. This well-organized garage provides an area for numerous activities. Rainy days and bad weather are no hindrance for the children in this family — everything from riding bikes to playing catch can be done indoors in the new organized garage. A television has been mounted to the wall for the parents and children to enjoy watching favorite shows or movies during playtime. Dangerous yard equipment and chemicals are all stored high up and out of reach, allowing the kids to run around and expend their energy in a safe environment. This customer has a one-car garage and no basement so storage is a premium in here. We did a wall of cabinets at the back. Another 6-inch deep cabinet to conceal the electrical panel, and various home automation controllers. Then slatwall everywhere else to cover up the builders crappy drywall finishing. Diamond plate paneling was used at the top and bottom of the walls to for ease of cleaning and a manly look. Shiplap pine paneling was stained grey to look like barnboard (without the thickness and weight) for the ceiling. We added potlights to replace the single lightbulb, and a smoke / carbon monoxide detector for safety. This project was a remodel of an existing laundry/mudroom, turning it into a mudroom with a high-end look and feel. Features in this mudroom include: a docking area for electronic devises, spaces for wet boot/helmets, drawers for gloves/hats, plenty of hanging spaces for a growing family, a bench for shoe/boot removal w/storage underneath a lift up lid. The owners of the family owned dental office, two brothers and a sister – all dentists working in the practice founded by their father – asked me to design and quote a custom solution. They were ecstatic with the results, preferring the value of custom storage built to their exact needs. Main Floor custom wine cellar cabinetry with interior back lighting, faux veneer brick backing, clear tempered glass doors, upgraded 18-inch appliance handles, and custom staining. A growing wine collection was the incentive to remodel the entire basement centering on the wine cellar and bar. Utilizing the U shape section in the foundation as the shape for the rooms layout. The client wanted a room that would become an invitation to experience the fruit of their wine collecting trips around the world. The wood and glass wall would allow friends to see the room as soon as the descended the stairs.